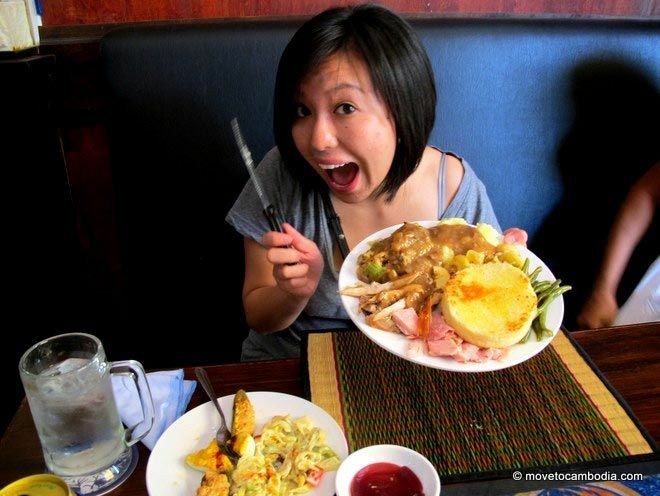 For all of the Americans in Phnom Penh, there are a few delicious Thanksgiving options. Last year many tears were shed in the expat community when there wasn’t enough turkey to go around, so reservations are advised! Gobble gobble! It’s almost time for Thanksgiving in Cambodia! The Thanksgiving menu at Alley Cat is even better than last year, with the addition of turkey. They are offering smoked ham and turkey, served with mashed potatoes, sausage gravy, green bean casserole, cheesy cauliflower, sage stuffing, cranberry sauce and dinner rolls plus pumpkin pie for dessert. Price is $12 and includes a free bottle of Becks, glass of wine, or a canned beer if reserved by Wednesday 21st. Served from 6pm, Thurs 22nd. Reservations advised. Expect a gourmet offering at Green Vespa this Thanksgiving. The menu consists of creamy pumpkin soup with a hint of nutmeg, roast American butter-basted turkey, butcher’s ham, corn on the cob, savory stuffing, cranberry sauce, roast and mashed potatoes with turkey gravy and cinnamon sugared apple crumble for dessert with vanilla ice cream. Price is $19.75 per person and reservations recommended. Price is $16 for adults and $7 for kids and home delivery is available. This entry was posted in Phnom Penh, Holidays and tagged Thanksgiving. Bookmark the permalink.